But Murray dropped a pre-Grand Slam bombshell, breaking down during a tear-filled press conference as he revealed chronic hip pain means he will retire after Wimbledon-if he can carry on that long. It all means the era of the “Big Four” is almost over after a season in which Federer-who opens his title defence against Denis Istomin today-rolled back the years on Rod Laver Arena to lift an emotional 20th Grand Slam. It put him on a par with other six-time Australian Open winners Djokovic and Roy Emerson-although the Australian great’s victories all came before the Open era. 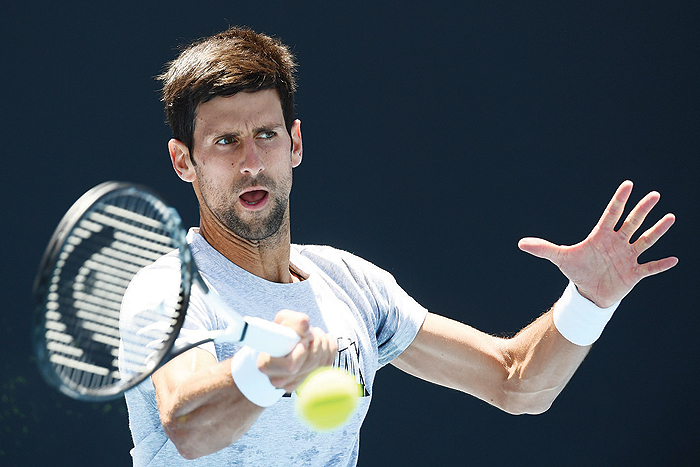 By contrast, the 31-year-old Djokovic endured a miserable early Melbourne exit in 2018, followed by elbow surgery and a string of disappointing results that saw him drop outside the top 20. But since winning a fourth Wimbledon in July the Serb rose inexorably back to number one by losing only three further matches-one of which was to Zverev at the ATP Finals. Djokovic won his third US Open in September to put him on 14 Grand Slams-three behind Nadal and six behind Federer. “It was my first major trophy, that obviously served as a great springboard for my career,” Djokovic said as he prepared to open his assault on a seventh crown against American Mitchell Krueger tomorrow. Federer, now 37, remains the chief threat to the Serb and he sounded a warning yesterday. “I’m playing good tennis. I’m confident that I think it needs a good performance by my opponent probably to beat me,” said the Swiss master, who warmed for Melbourne with victory in Perth’s Hopman Cup. Second-ranked Nadal, 32, pulled out of Brisbane with a thigh strain although he returned for an exhibition in Sydney and insisted at the weekend his fitness woes were behind him. “I feel good. If I am not feeling good, I will not be here,” he said before revealing he had remodelled his serve. “There are always things to improve,” said the Spaniard, who faces Australian wildcard James Duckworth today. Djokovic picked young guns Zverev of Germany, Borna Coric of Croatia, Karen Khachanov of Russia and Greece’s Stefano Tsitsipas as key threats to the top three. “It’s just a matter of time when we will see some of them competing in the last stages of Grand Slams,” said Djokovic. Zverev, 21, starts the Australian Open full of confidence after an impressive warm-up to reach the final of Perth’s mixed teams Hopman Cup, despite his terrible record at Grand Slams. He has never got beyond the third round in Melbourne and faces Slovenia’s Aljaz Bedene in his opener tomorrow. Last year, seeded four, he crashed out in the last 32 to South Korea’s Chung Hyeon and has only reached one quarter-final in 14 major appearances.